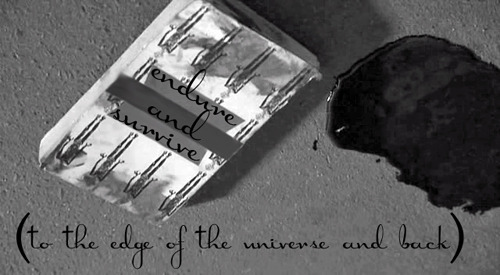 notes: Made in the teenwolf_bb for blindinglights fic, Endure and Survive (to the Edge of the Universe and Back). summary: Sterek zombie AU. Watch the vid, then read the fic. Or read the fic and watch the vid. Hee - that's awesome! The introduction of Derek's character made me smile. Lol, that was fun to edit. In my head I actually thought "and this is the part where undies come off." That was fab! I'm off to read the fanfic now. Thanks. I didn't vid the entire fic, there's still plenty unspoiled. There's still a good 2/3 of the fic left when the vid ends. OMG. your video is awesome. Perfect. PERFECT. PERFECT. PER- ok i'll stop. Thank you. I wish I could have done more. I lovelovelove zombies and I lovelovelove making zombie AU vids. I have plenty more to come, lol. Thank you! I'm reading the final version this afternoon.